At Frampton Park we're making the most of underused land at 4 locations to build more than 100 much needed new homes, as well as helping to create an improved environment for existing residents. The first of these are the site of the former Frampton Arms pub on the corner of Well Street and Frampton Park Road, which closed in 2002 and was demolished in 2012, and Lyttelton House, a small block of 6 bedsits that didn't meet modern standards. We're now exploring plans to build further new council homes at 2 other sites, replacing the garages and old underground car park at Tradescant House and the underused Frampton Park Community Hall. We think the Tradescant House and Frampton Park Community Hall sites could accommodate around 60 additional homes, around two thirds of which would be for social rent and shared ownership, with outright sale of the remaining homes to help pay for them. The social rent homes will be allocated to families on our housing waiting list, with first priority for people in housing need living on the Frampton Park Estate. The shared ownership and outright sale homes will be sold by our in-house sales team, Hackney Sales, in accordance with our sales and marketing principles. All the new homes will incorporate improvements to the public spaces around them. At the Frampton Arms site this will include a shared courtyard for both new and existing residents, and new play facilities. 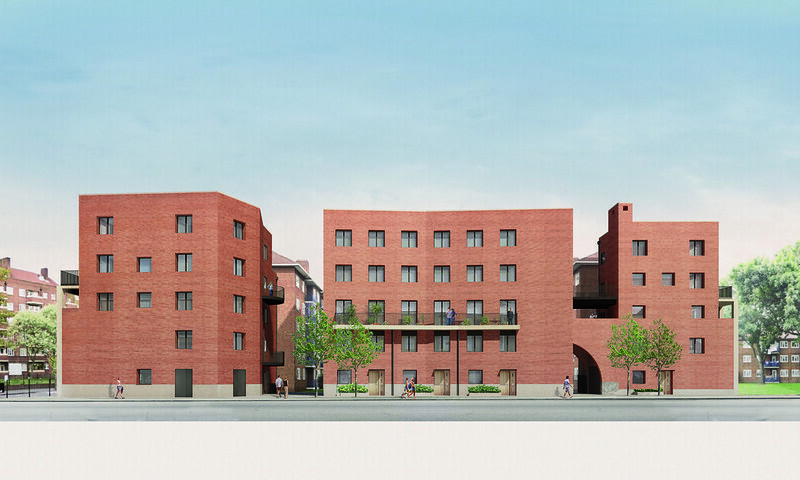 We think the homes at the 2 new sites can help make improvements to public spaces around them. We're already speaking with the users of the hall to ensure that any valuable community services and activities can continue, either on the site or nearby. The designs at Frampton Arms and Lyttelton House have been led by Henley Halebrown architects, who have designed these new developments to create a more traditional street front along Well Street and improve the links between the estate and the wider area. We've now appointed local practice East Architects to being exploring ideas for the additional sites. Planning permission for the Frampton Arms and Lyttelton House sites was received in September 2016. Initial work on both projects began in 2018, with the homes scheduled to be completed in 2020. We will shortly begin speaking with the local community about what new homes at near Tradescant House and at the Frampton Park Community Hall could look like later in 2018.